Similar to the Old Testament, the way the New Testament came together is a bit messier than most understand. LDS typically understand that all the NT books were written by its namesake as author. That the gospels were written by first hand witnesses of Jesus. We believe there may have been some hijacking of the translations after they were written, but we have an expectation this is relatively minimal. And if that did happen, we believe it would generally be in taking out “plain and precious” truths that might point stronger to LDS truth and not the opposite. Modern New Testament scholarship goes like this. Between 50 and 150 AD, many books related to Christianity were written and circulated. It was common for an author to fake like they were writing as one of the original disciples of Jesus to gain credibility for their work. 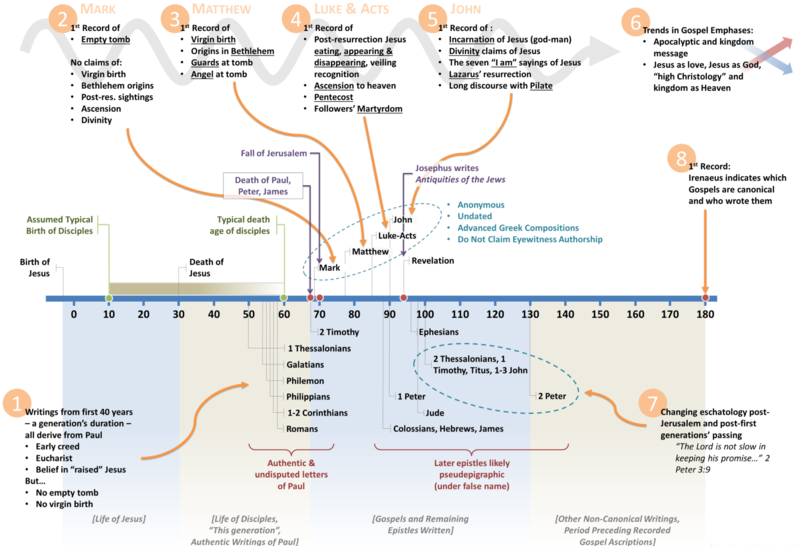 The following diagram illustrates a fairly mainstream summary of New Testament formation. Most of the first hand witnesses of Jesus were likely dead by the year 60 AD and none likely survived past about 70 AD. Mark is considered to be the first gospel written around 65-75 AD and not written by apostle Mark that knew Jesus first hand. Then scholars believe there was a book (or if not a book–a consistently repeated oral compilation of stories) written we don’t have, they call Q. Q was likely written soon after Mark. Then within the next 20 years, Mathew and Luke were produced, using Mark and Q as source material. By this time, all first hand witnesses have been dead for decades. John was the last gospel written circa 90-100 AD, by an unknown author in Greek. About half of Paul’s letters are believed to be written actually by him. None of the other works from John, Peter, and James were written by the original apostles. The authorship issue is marginally troubling for a literal believer. But what’s more problematic is how we see the evolution of actual content. Generally speaking, the earliest material has the lowest amount of references to Christ as divine, ie virgin birth, resurrection, claims to be the Son of God, post resurrection visitation, etc. With the high Christology strongest in the later sources. Personally for me, I was always moved by John talking about himself how he was the “disciple Jesus loved”. I was upset at first to think John didn’t really write this. That the person who wrote this never even met Jesus. But then as I think through this, and I think this is the key to understanding all scripture, is that even though John might not have written it, or even if it might not have happened in a literal sense exactly this way, viewing it metaphorically is equally powerful and touching. The power in the story really has nothing to do with John. The power in this story is that we imagine that Jesus Christ, the Son of God, would be so intimate with a human being. And that human being is not John. It’s me! It’s the person reading the story and picturing the scene! We’re at the Last Supper, in that intimate setting with Jesus and his closest friends, having the best seat snuggled up next to Jesus, imagining ourselves as the one that he truly loved the most. Jesus taught in parables. Is it possible to view his entire life and death and resurrection as the ultimate Parable of God? Is is it materially different to believe that the actual historical figure Jesus Christ in the New Testament is actually the Son of God or to believe the description of that Jesus in the Bible and in the Book of Mormon is a perfect description of how God would appear to man? Scripture is seen as metaphorical. Faith is an expression of loyalty, devotion, worship and doctrinal alignment but not necessarily a belief in the factual accuracy of scripture or historical religious origins. Challenges to scriptural historical events are not damaging to faith. I believe most of the textual criticism scholarship on the New Testament as stated here. I am uncertain on the question of the divinity of the historical figure Jesus Christ, though at the same time I have faith in and worship Jesus Christ as the Son of God and Savior. Some literal believing LDS might acknowledge some aspects of NT textual criticism, such as the possibility different authors wrote books that were ascribed to Paul. But literal belief in the divinity of the historical Jesus Christ is imperative. The New Testament is actual, correct history of the events of the Savior’s lives and the apostles after his crucifixion. The actual reality lies somewhere in between the two above views. Some nuanced LDS believe in the theories scholars have of how the New Testament came about, but still believe in the actual miracles and resurrection of the historical figure Jesus Christ. Some take the position similar to mine that it’s the teaching and the symbol of God that is critical, not the actual historical record in the New Testament. The Bible is the word of God. Jesus is the Christ, the Son of God, and representation of God condescended to Earth to be born and live as a man. He is the author and finisher of our faith. He is the Way, the Truth, and the Life. We testify of Him.